Nehemiah's task was a short-term project that had eternal results! Modern mission history is a story of heroes; men and women who gave up their inheritance, left family and friends to obey the Lord’s command, and in the face of great odds, conquered lands and peoples for the sake of the Kingdom. A quick survey of modern mission history reveals that many of these heroes of the faith were the young people of their day called upon to save a world that was lost. “When students decide to act, things happen. That's the history of missions." 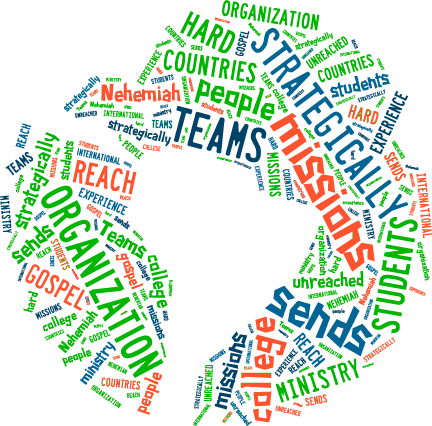 The missionary movement has had tremendous vitality often sparked by students with a world-wide vision. In the same way, Nehemiah Teams are leading the next generation to reach every nation... standing in the gap among the unreached and the hard-to-reach. Nehemiah Teams offer short-term mission projects that have eternal results. At NT, we believe this generation has a rendezvous with destiny. Join Nehemiah Teams this summer! Don't feel led to go overseas?? Serve among the unreached who are living in the United States. Click on photo above to go to the NT/P52 blog! READY FOR MORE THAN A SUMMER?!! Nehemiah Teams Connecting (NTC) offers a way for churches, campus ministries, and other student groups to adopt a field-based project request or conduct their own project. NTC provides training and support.